Are you looking for ways to make your gym safer, and also make it more attractive at the same time? Choose gym wall pads to reap these benefits and more. As the owner or operator of a gymnasium, you must already know that there is no such thing as having too many custom gym wall pads . After all, you can never be too careful! Protective equipment like wall padding, while not completely effective in eliminating injuries, can still help prevent serious falls and fractures. If your establishment doubles as a gym and an auditorium, using stage protection pads is a wise idea. We can personalize gym wall pads with graphics like school logos, names or sponsors in many colors and sizes. • We provide these panels in standard sizes like 1/2” plywood with 2” bonded foam (density 6lb) and a double coating of 14 oz vinyl. • You can also opt for custom-cut sizes to fit outlets, recessed doors, I-beams, columns and vents. • We offer a fire retardant inner lining of Vonar, making our padding compliant with fire safety codes. Gym wall pads are available with 3/4” wood furring and can be installed indoors and outdoors with two types of installation setups. These panels can be attached to the wall with the Lip/Margin or the Z-clip hanger brackets to avoid using nails. While we provide multipurpose stage pads with Velcro attachments to facilitate easy installation and removal; these can also be used to protect the bleachers when not in use, as well as univents located on the court-side and operable partitions. Outdoor wall padding include 18oz vinyl lining that is sturdy enough to protect goal posts, railings and any other outdoor obstructions. Ideal for providing additional protection in exterior fields, our outdoor pads are available in 1/2” exterior plywood with a double coating of vinyl. They can also be used for portable classrooms, chain link fences and storage containers. While providing customized solutions for your gym, we neither compromise on quality and safety, nor do we overlook style for functionality. 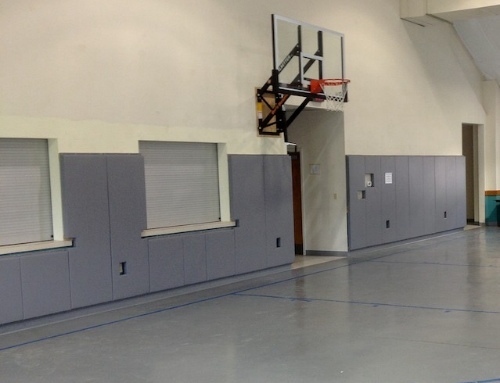 For more information on how you can make your gymnasium safer with wall pads and outdoor panels, contact our experts at ACC today.